Stablon, also known as tianeptine is an antidepressant drug that achieves the same results as well known antidepressant medications such as Paxil and Prozac but which works in a novel way that does not cause the usual loss of libido, drowsiness and weight gain side effects associated with these products. Clinical studies focusing on the treatment of elderly people with Stablon Tianeptine have found that it is a very effective medicine for depression and related conditions such as insomnia and fatigue. This ability to work across a broad spectrum of depressive disorders and symptoms is another significant asset of using Stablon. Dr. Richard Brown -a renowned New York psychiatrist – reported positive results using Stablon with his patients. His studies concluded that it does not cause sexual dysfunction or weight gain and helps across a range of depressive conditions. Other research by Loo, Saiz-Ruiz and others has compared Stablon to more high profile antidepressants such as fluoxetine / Prozac, these studies have also reported good levels of both effectiveness and safety. Stablon works in a unique and innovative way because in contrast to the likes of Prozac and Paxil which are selective serotonin reuptake inhibitors (SSRIs), Stablon is a selective serotonin reuptake enhancer (SSRE). This simply means that SSRI antidepressants block the absorption of serotonin working on the premise that the more serotonin circulating in the system the better, whereas SSRE antidepressants like Stablon actively work to increase the uptake of serotonin. How Much Stablon Should I Take? Stablon can be taken two to three times daily, but if you are also taking other antidepressant medication such as Monoamine Oxidase (MAO) inhibitors or serotonin inhibitors (SSRIs) then you should consult a physician for dosing guidance. Stablon is an effective and safe alternative to more well-known treatments for depression but it’s unconventional mechanism offers many benefits to patients and is backed both by clinical studies and eminent physicians such as Dr Brown. Stablon enables you to fight depression without the loss of libido, sleep and weight gain. Have you heard of customers using stablon with low ‘anti-aging’ doses of deprenyl/selegiline? With regard to tianeptine (Stablon®) and deprenyl, there are many people using low dose deprenyl with anti-depressants that are MAO inhibitors. Of course deprenyl in low dosages is only a MAO-b inhibitor, and most anti-depressants contraindicate with MAO-a inhibitors, and every other drug that is a MAO inhibitor is an inhibitor of MAO-a. Under such circumstances we would recommend the deprenyl liquid over the tablets, because then low dosages can be easily titrated, i.e. 1-2-3mg per day. However, this does not of course mean that there will be no contraindication for you, and that we have to advise that in all such circumstances that you follow the advice of your physician etc. Typical dosages are 12.5mg two or three times daily. 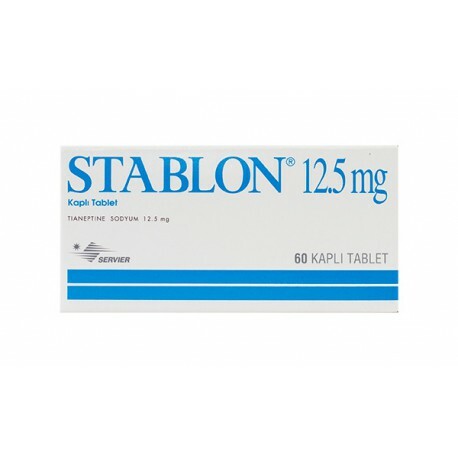 Like most anti-depressants, Stablon could interfere with other anti-depressants, particularly MAO inhibitors (including Gerovital-H3) and other SSRIs such as Prozac®. Therefore, if you intend to combine Stablon with any other anti-depressants, you must only do so under the guidance of a physician.